All of the 730 survey respondents work as professional prison chaplains or religious services coordinators in state prisons, including privately run prisons that operate under state contracts. Their workplace environs vary, with most serving in facilities designed for male inmates and housing an average of about 2,000 inmates (mean = 1,965 inmates). The chaplains are a well-educated group, with a majority holding graduate degrees in religion-related fields. 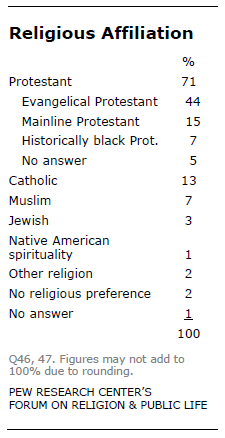 About seven-in-ten identify themselves as Protestants (71%), and 44% say their denomination belongs to the evangelical Protestant tradition. Generally speaking, the chaplains indicate that they hold theologically conservative views when it comes to their religion. A majority say their social and political views are conservative as well. Chaplains serve in a wide range of settings. Most of those surveyed work in a single correctional facility, although a quarter (25%) divide their time across multiple facilities. About eight-in-ten report that they are employed directly by a state correctional system (81%). Other arrangements include working as a contractor (8%), working for a private prison management firm (5%) or working through a religious organization (5%). The chaplains’ level of direct contact with inmates varies considerably. Nearly half of the chaplains surveyed report having direct, one-on-one contact with about a quarter (39%) or fewer (8%) of the inmates in the prisons where they work. About a fifth (19%) have direct contact with about half of the inmates, and the remainder say they interact with about three-quarters (12%) or with almost all inmates (20%). A plurality of chaplains work in facilities that contain more than 1,000 and fewer than 2,500 inmates. For those working in a single facility, the average number of inmates reported is 1,965. The median number is 1,500, meaning that half of the chaplains working in single facilities are responsible for 1,500 or more inmates. Those working in multiple facilities report a wide range of inmates, from about 120 to more than 50,000. On average, these chaplains are responsible for a total of 4,968 inmates across all the facilities in which they work; the median number of inmates they are responsible for is 1,962. About half of the chaplains surveyed (53%) have 10 or fewer years on the job in the state prison system, 34% have between 11 and 20 years of service and 12% have worked as prison chaplains for more than 20 years. The average tenure is 11.3 years. Most of the chaplains surveyed are male (85%), and their average age is 57. Only 16% are under 50. 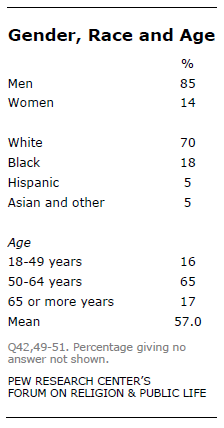 About two-thirds (65%) are between 50 and 64 years old, and 17% are 65 or older. Seven-in-ten (70%) of the chaplains surveyed are non-Hispanic whites, 18% are black, 5% are Hispanic and 5% are Asian or some other race, and 2% did not specify. About half (49%) previously have worked as a chaplain or religious services coordinator in some other institutional setting, such as the military or a hospital. And about four-in-ten (43%) of the prison chaplains currently hold a second position as a minister, pastor, rabbi or imam in a house of worship outside the prison walls. Most chaplains report working an average of 32 to 40 hours (39%) or more than 40 hours (45%) per week for the state prisons. Only about one-in-six work a part-time schedule of 31 hours or less (15%). Most chaplains surveyed are Protestant, with the lion’s share coming from an evangelical Protestant tradition. About seven-in-ten (71%) chaplains identify as Protestants, 13% are Catholics, 7% Muslims and the remainder identify with other religions, including Judaism and Native American spirituality. A plurality of the chaplains (44%) consider their faith to be part of the evangelical Protestant tradition while 15% come from a mainline Protestant tradition and 7% are from a historically black Protestant tradition. Six-in-ten (60%) chaplains believe their religion should preserve traditional religious beliefs and practices. 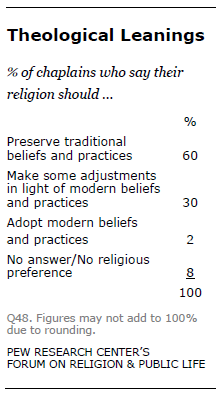 Just 2% say their religion should adopt modern beliefs and practices, while three-in-ten (30%) take the middle ground, saying their religion should make some adjustments in light of modern beliefs and practices. Evangelical chaplains are more likely than those of other Protestant traditions or faiths to believe in preserving traditional beliefs and practices; 71% of evangelical Protestant chaplains believe religious tradition should be preserved, and 26% take a middle-ground position on religious tradition. Mainline Protestant chaplains, by comparison, are more evenly divided between those who think that traditional beliefs and practices should be preserved (45%) and those who favor some adjustments (46%). 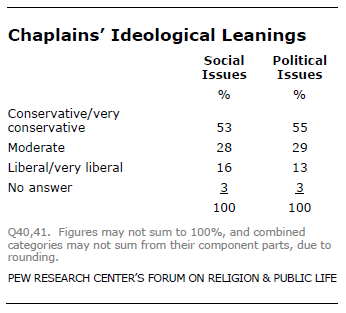 A majority of chaplains report holding conservative views on both social and political issues. Overall, 53% of chaplains describe their views on social issues as conservative or very conservative, 28% are moderate and 16% are liberal. Similarly, when it comes to political issues, 55% say their views are conservative or very conservative, 29% moderate and 13% liberal. 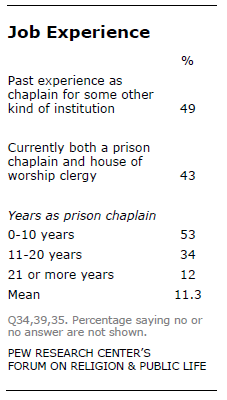 As expected, the prison chaplains surveyed are a well-educated group. About six-in-ten (62%) hold either a master’s degree or a doctorate, 21% hold a bachelor’s degree and 15% did not complete a four-year college degree. Nearly all of those with a graduate degree (90%) specialized in a religion or ministry-related field. Overall, 56% of the chaplains surveyed completed graduate studies in a religion or ministry-related field. A majority of chaplains surveyed also report having at least some clinical pastoral training, which can take place inside or outside of a degree program.17 About three-in-ten (29%) have completed four or more units of training, 32% have completed 1-3 units and 36% have had no clinical pastoral training. Those with more formal education are more likely to have had clinical training. Among those with a graduate degree, two-thirds (67%) have completed at least one clinical pastoral training unit. Among those with a college degree, 55% have completed at least one unit, and among those with less education, 51% have done so.